“Devoting time at the event to custom video production is one way we added value to the suppliers’ EPPS investment,” notes Rachel Schultz, ECRM’s marketing & communications manager. 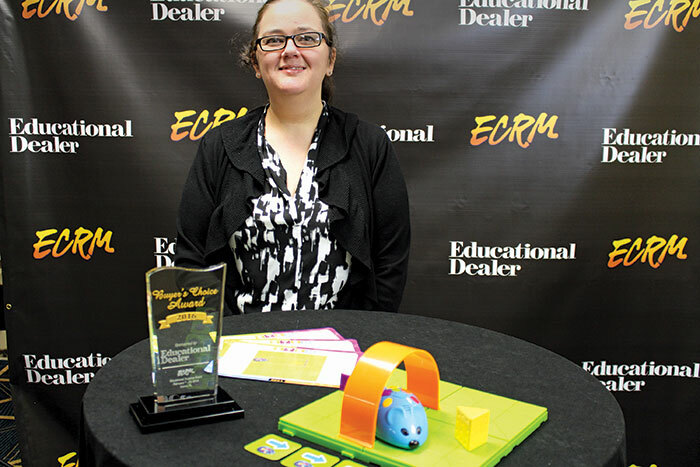 Now in its sixth year, ECRM’s Educational Supplies Efficient Program Planning Session (EPPS) consists of one-on-one strategic meetings that connect buyers with sellers. More than 70 buying companies participated in the 2016 EPPS in Destin, Florida. ECRM’s private-meeting format is designed to streamline the sourcing process, grow incremental sales and uncover industry trends. ECRM manages EPPS events for a variety of industries that range from general merchandise – like pet supplies and household electronics – to pharmacy and grocery categories. Next year, ECRM is launching a gold-jewelry EPPS. ECRM (for Efficient Collaborative Retail Marketing) matches vendors with buyers in advance of EPPS, based on company profiles submitted by each participant as well as company capabilities. A custom schedule is prepared with buyers moving from presentation to presentation. Each individual’s schedule is available ahead of time on their cell phone or tablet, thanks to the ECRM Connects ™ app. “Buyers and sellers are prequalified before the meetings are scheduled to make sure that their business capabilities align,” explains Schultz. “A personalized account management team and best practice programs support the customized format. It all helps participating companies execute their business objectives more effectively. 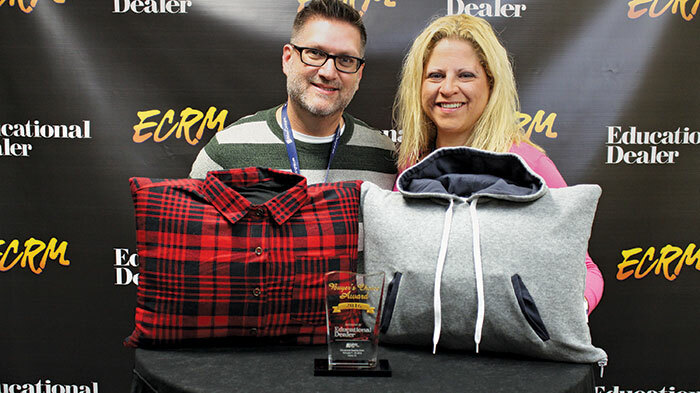 Three new products were honored at the EPPS with Educational Dealer’s Buyer’s Choice awards. 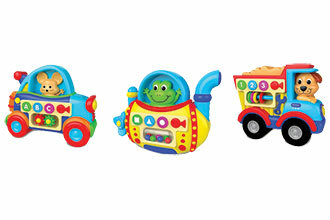 The top choice among voting buyers was Three Little Piggies, a brain game for children ages 36 months to 10 years. “Kids are intrigued by the way the pigs fit inside the houses and look through the windows,” says the description from manufacturer Smart Toys and Games. The game features three big puzzle pieces that are easy to hold, plus a storybook with images and a booklet with 48 challenges. Sally Lovell from Learning Resources and the Stem Robot Mouse Coding Activity Set. 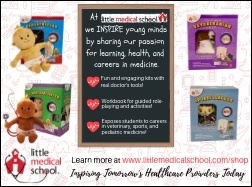 In second place was Learning Essentials Stem Robot Mouse for children ages 5 and up, from Learning Resources. With the set, kids build a maze and then use coding cards to create a step-by-step path for Colby, the Programmable Robot Mouse. Todd Belcovitch and Stephanie Mitelman from Senseez with their award-winning vibrating pillows. Third place went to the Sensory Cushion Hoodie from Senseez Pillows. The portable vibrating cushions are especially helpful for children with autism, ADHD, or sensory processing disorder. They calm kids who need more sensory feedback, or help hypersensitive kids tolerate more sensations. 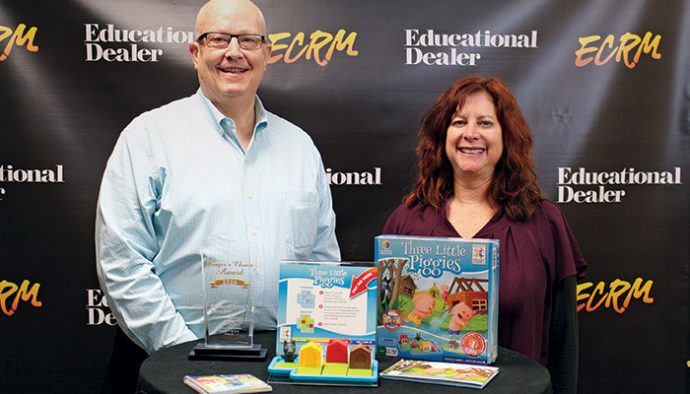 Like Educational Dealer at the Educational Supplies EPPS, edplay toy trade magazine will launch an awards program at the first-ever Specialty Toy EPPS in April. edplay, another Fahy-Williams publication, will also record and produce product demonstration videos available for view on edplay.com.